Volts Energies are a Canadian Victron Energy dealer based in Laval, Quebec – and it seems their customers’ motorhomes (RVs) are just as large as their American neighbours. Such behemoths require serious batteries. Over the last 15 years Volts Energies have specialised in off-grid photovoltaic solutions, providing energy systems for recreational and commercial vehicles, boats, plus residential and commercial remote sites. They install Victron Energy products all over Quebec and sell them throughout Canada. In this guest blog, Céleste Léal who takes care of Renewable Energy Technical Support at Volts Energies takes up the story. A motorized converted mobile home, that requires a lot of energy to live at home on the road while visiting America. 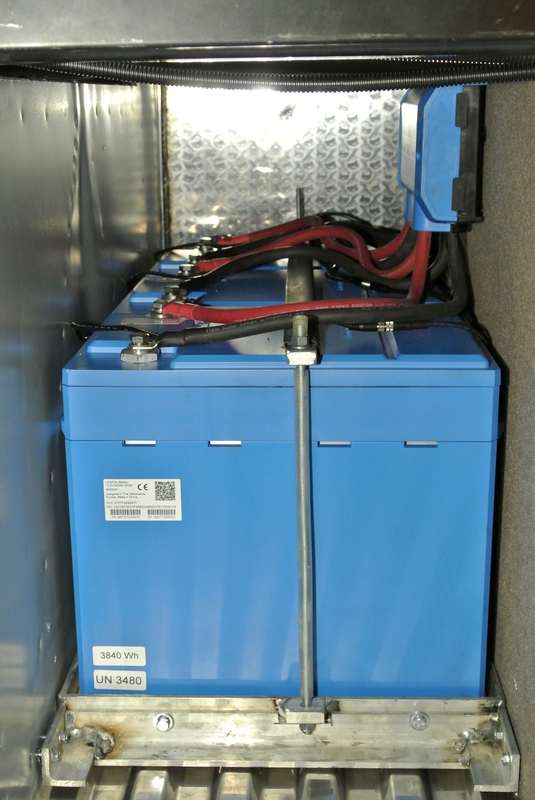 No less than 900Ah of 12.8V lithium batteries, totalling 11.5kWh of stored energy, with a 9.2kWh useable energy reserve – this is what was recently installed by Volts Energies in a converted bus. The lightness of the product (compared to lead), its flexibility of use and its life span are all reasons why lithium batteries are an excellent choice of energy reserve for a motorized vehicle. Victron Energy’s LiFePO4 lithium batteries come with safety and control devices to maximize their potential while maintaining their lifetime. 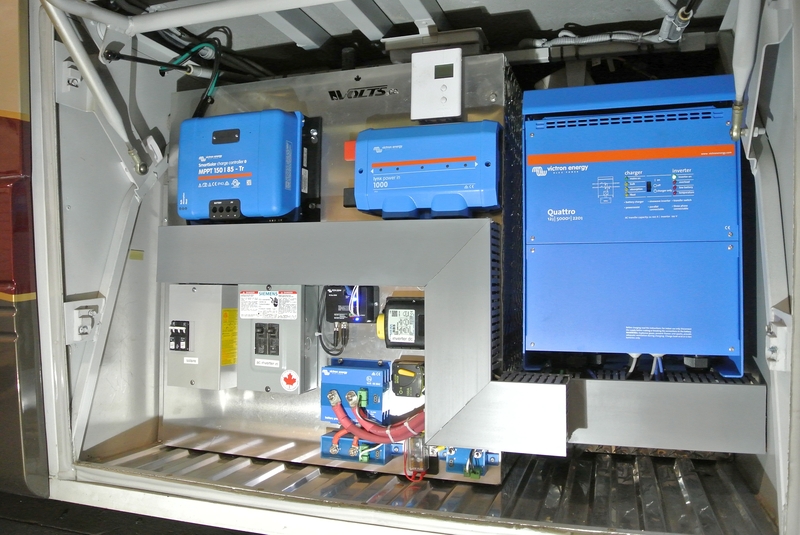 To provide 110V electricity in the RV, a Quattro inverter / charger from Victron Energy has been installed. Drawing energy from the three 12V batteries, the inverter can provide 5000W of electricity continuously, allowing the microwave, refrigerator and even the air conditioning of the vehicle to operate. 12V loads, such as lighting, are also provided. For both DC and AC loads, a safety device cuts the power supply from the batteries in the event of a deep discharge, to avoid damaging them if excessive power consumption occurs in the motorized vehicle. But how to recharge the batteries on the road? 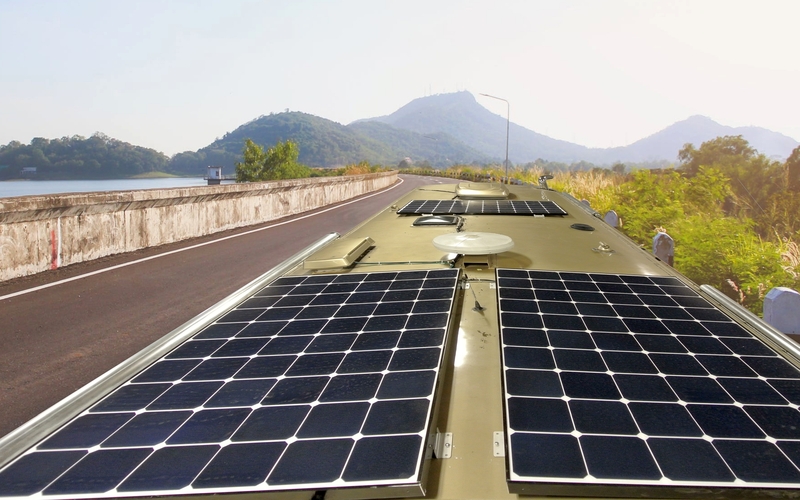 In addition to the vehicle’s alternator that recharges the batteries while driving, three solar panels of 360Wp each have been installed on the roof of the bus. A solar charge controller from Victron Energy, supporting up to 150V of solar panels, optimizes the energy of the sun to distribute to the batteries, with a charging current of up to 85A. When cloudy weather does not allow for battery recharge, the generator installed at the front of the vehicle can take over. Through the Quattro, which also has a charger function, the generator can provide up to 220A of recharge current to the batteries. When the vehicle is parked and plugged into a 110V power outlet, the Quattro will also charge the batteries from this source. What to do when the outside temperature goes down too low? Lithium batteries do not like negative temperatures and recharging them in these conditions can cause serious damage. Here again Victron Energy components work together to detect low temperatures, warn the user with an audible alarm, and prevent the different charging systems (solar energy, alternator and grid) harming the batteries. The user can then start the vehicle to warm the cabin, then recharge the batteries in good conditions when the temperature is raised back to normal. To monitor and interact with its energy system, the user has several control screens placed near the driving position. The BMV-712 battery monitor displays all important battery status information: current voltage, current draw, state of charge, remaining usage time, temperature, etc. One can program an audible alarm, for example to warn the user that it is time to recharge their batteries. Victron Energy’s Color Control GX is the control and communication center of the system. It receives information from all components to display to the user. It is easy to visualize the energy getting in and out of the system, through recharge and consumption. Many settings are also accessible in the control panel menus. The Color Control is also the link between the energy system and the internet. Victron Energy has an online monitoring portal (VRM), where you can remotely monitor an off-grid system. Using a USB wireless transmitter, the Color Control transmits its information to the monitoring portal. Installing so many components, to replace the previous and outdated system, was a major challenge. Limited space, existing wiring to unravel were all obstacles that had to be overcome to achieve the installation. Combining several sources of battery charging, new or already present on board was not without difficulties either. Some electrical circuits had to be modified to ensure that the operation of one did not conflict with the other, and that component could recharge the batteries. 3 x LiFePO4 Battery 12.8V/300Ah Smart batteries. Note that the protective battery terminal caps were not installed at the time of this photo. Then came the testing phase, to make sure that the system would work at its best performance, while recharging the batteries to ensure a long life. The functional tests also brought their share of surprises, which led to new modifications, to adapt to the existing system. At the end of this project, the Volts Energies team built a high-performance and safe installation to ensure a reliable energy reserve for motorized travel enthusiasts.